Paper mache is a craft that has origins in ancient China, where artisans made items from a paper and paste mixture then hardened them with a clear lacquer. 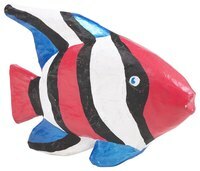 Today, paper mache is a popular craft enjoyed by adults and children alike. With paper mache mixtures, you can make holiday decorations, sculptures, gifts and classroom projects. Although it may seem difficult to craft your own paper mache objects, making the paper mache mix itself is easy to do using inexpensive ingredients found at home. Mix the flour and water in a saucepan using your hands. Break up lumps of flour and blend it into the water until you have a smooth mixture. Heat the mixture on the stove over a medium heat, stirring constantly with a wooden spoon. Add two or three drops of wintergreen to retard molding. This is not necessary if you are going to use your mixture right away. Remove the mixture from the heat once it has thickened to a paste-like consistency. Allow the mixture to cool before use. If you are not going to use the mixture immediately, store it in an airtight container. Don't add paper strips to the mixture until you are ready to start your project. Soak paper strips in the paste mixture until they are saturated. Use the strips to create your paper mache project. If you are using a mold, smear it with petroleum jelly, cover it with one or two layers of the soaked paper strips, then leave it to dry. Recycle old newspapers or discarded office paper to make strips for paper mache. Balloons, plastic bowls and cardboard shapes can be used as molds for paper mache projects. For more advanced designs, create frames out of wire. Adults should always help children when heating paper mache mix over a stove.